The Elusive Plantation Rum Stiggins’s Fancy. Photo credit: Rumba. World-wide rum sales are dominated by a handful of producers–the three goliaths of Bacardi, Captain Morgan, and McDowell’s, a rum made in India. The dominant thrust of Bacardi and Captain Morgan’s marketing is toward inexpensive rum with a fun, beach party atmosphere. For that reason, the rum-loving community (myself included) generally doesn’t focus on the big players. Instead, most of the attention goes to producers the average consumer hasn’t heard of, minuscule compared to the goliaths and perceived of higher quality and craft. Within the long tail of rum producers, one of the most respected is Plantation Rums. My personal collection contains more than a few of their offerings, so when Kate Perry of Seattle’s Rumba mentioned that Plantation Rum president and master distiller Alexandre Gabriel would be visiting Rumba to host a tasting, I practically lost my cookies, counting off the days till the event. Within the spirits industry, there are two basic types of producers: those who distill and sell their product and those who buy distilled product from a distiller and then (hopefully) add their own stamp to the finished goods, typically via additional aging or blending. Plantation Rums is in the latter category, however don’t think that Plantation is merely reselling someone else’s rum. 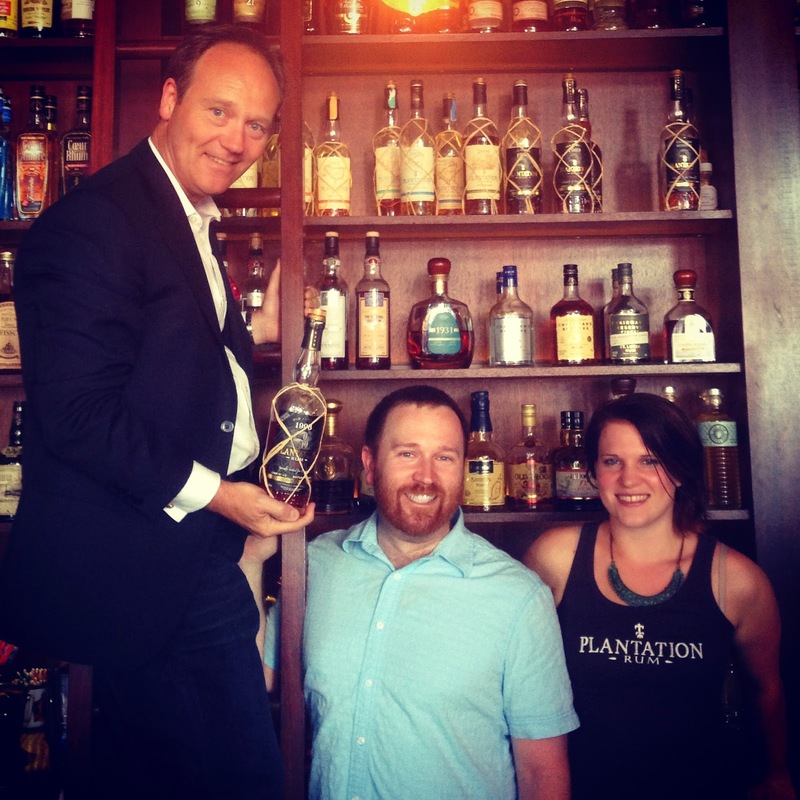 – There’s a great story to tell about Plantation’s rums. The Plantation rums are one of several product lines from Pierre Ferrand, a French company that got its start distilling cognac and today still creates some well-regarded cognac at very reasonable prices. Under the leadership of Alexandre Gabriel, Pierre Ferrand has expanded into several different spirits categories, including but not limited to cognac, rum, gin, and calvados. For the Plantation line, Alexandre purchases premium aged from established rum producers, mostly in the Caribbean, and then ships the rums to France where they undergo a second aging in used barrels sourced from the Cognac side of Ferrand’s operations. Some of the higher-end Plantation rums even go through a third aging (more on that in a bit). The less expensive Plantation rums are phenomenally priced and great for mixing. The more expensive, single vintage rums are outstanding sipping rums. The primary person behind all this rummy goodness is Alexandre Gabriel, a Frenchman who initially was brought into assist the struggling Maison Ferrand Cognac with their sales, and today is the president, majority owner, and Master Blender. It was on a trip to the Caribbean that Alexandre sampled some rums and had the insight that finishing these rums in his previously used cognac casks could yield great results. Plantation is now the realization of that vision. At this point the company has put out several dozen releases, and I’ve thought favorably of every one I’ve tried, so I was naturally very interested to meet Alexandre and hear him speak about rum. Alexandre Gabriel being introduced at Rumba. The tasting lineup. Photo credit: Rumba. On the placemat was a mysterious sixth spot without a tasting glass, with a lone pineapple image. Mid-way through the tasting, I saw Rocky Yeh, a very well-known portfolio ambassador and friend of Plantation Rum slip into a seat near the back with a single bottle. Could it be the very rare and coveted Stiggins’s Fancy? Yes! Suddenly the pineapple image made perfect sense. 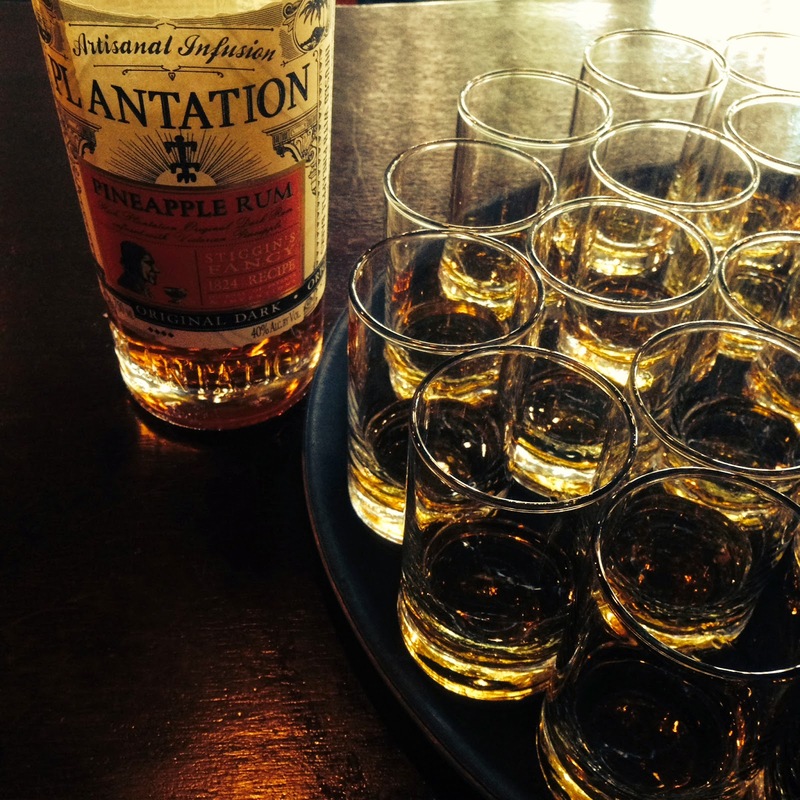 We were in for a bonus tasting of the Plantation pineapple rum that’s not for sale, and may never be for sale. More on this in a bit. 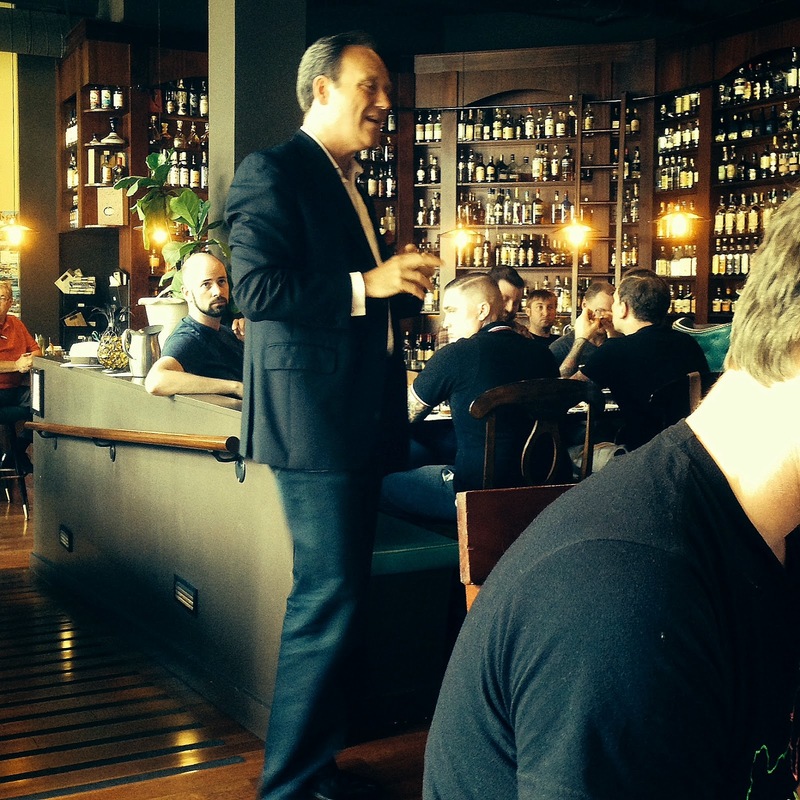 Alexandre Gabriel imparting the rum knowledge. Photo credit: Rumba. We must change to stay the same. While it’s fine to strive to recreate flavors from years past, it’s not as simple as slavishly using the same ingredients, because the ingredients themselves are changing. Global warming affects how plants grow and how they taste. He gave the example of the taste of a particular grape, Folle Blanche, that has changed significantly over the past decades. As such, if we want to replicate old tastes, we must experiment with new techniques and starting materials. Terroir means three things to Alexandre: Two are well-accepted, the third may be debatable. · Soil and climate: This is well established and generally accepted. · Environment: For example, during aging in a wet cellar, the alcohol content will evaporate more quickly, whereas in a dry cellar, the water content evaporates faster, which obviously affects the resulting flavors. Another example he offered is that a freshly painted cellar room can affect the eventual flavor in a negative way. · Local know-how: The way people do things during the production process. Alexandre believes this is part of terroir, but accepts that some may disagree. A new cognac barrel can cost in the $1,000 price range, whereas a used barrel may only fetch $30. This was one reason why Alexandre was looking for ways to reuse his own barrel stock. Plantation Rum is now a big consumer of its sibling’s cognac barrels, but used barrel supply still exceeds demand. Cognac is like classical music. The score has already been written, i.e. there are all sorts of rules and regulations, so cognac is mostly about how the music is “played.” In contrast, rum is “anything goes.” The lack of rules allows for much more new techniques and experimentation. American oak barrels provide the whiskey lactone, also known as the coconut/vanilla flavor you often get from spirits aged in it. Most rum that Plantation buys from the Caribbean is aged five to ten years, and only 65 percent of it remains in the barrel due to the angel’s share (evaporation). Adding water to a spirit can release smells and flavors. However, that reaction really only happens once, so it should happen immediately prior to serving. To minimize flavor release during dilution prior to bottling, Plantation takes special steps including introducing water very slowly, as well as letting the water first sit for a while in a cognac cask. During distillation, the “tails,” which are the chemical compounds that boil at a higher temperature than ethanol and hence come later in the distillation, are what give a rum its particular character. As such, some amount of the tails is usually included in the finished product. The rum producers of Barbados– Mount Gay, Foursquare, etc.–have perfected the blending of pot and column still rums, creating light rums that have lots of character. Spanish rums came to the party relatively late, primarily because during rum’s formative years, Spanish parts of the Caribbean were still consuming spirits from Spain. By the time the Spanish-held territories started producing rum, the column still had been invented and was more efficient than pot stills. Thus, rums from Spanish territories are typically made in column stills, so are relatively light. The French Agricole style, which uses sugar cane juice rather than molasses as a starting point, came about because of war between England and France. In the early 1800s, England blockaded France’s trade routes with the Caribbean, leaving the French territories with no place to sell their sugar. As a result, they started distilling rum from the cane juice. Voila!Rhum agricole. Plantation has released an agricole-style rum (the Guadeloupe, which we sampled), but it can’t be labeled as such because it doesn’t meet the French AOC regulations. I found the Guadeloupe rum had the distinctive agricole flavor, but more refined and very “Plantation-like” in taste – Smooth and slightly sweet. Plantation uses the elevageprocess for aging, which is much more labor intensive than simply putting the rum in a barrel and letting it rest for some number of years. Plantation’s process includes sampling sixty to eighty barrels a day to frequently assess how they’re coming along and possibly making changes along the way. For instance, if a particular barrel begins to get a certain characteristic that’s impacted by wood, the barrel may be emptied, a single stave replaced, and the barrel refilled to continue aging. Another less drastic example would be moving the barrel from one warehouse to another to provide a different environment. Some higher-end Plantation rums, typically the “black label” editions, are aged a third time in a different type of cask, frequently one having held Pineau des Charentes, a sweet liqueur made from blending aged cognac with fresh grape juice. I find the flavor added by Pineau cask aging to be among my favorite rum tastes. Plantation Rums has put out many releases, only some of which are available in the U.S. Sometimes the issue is simply that relatively small amounts are made, but frequently the trouble lies with the U.S. TTB (Alcohol and Tobacco Tax and Trade Bureau), which imposes strict and often arbitrary restrictions that make some releases difficult to import into the U.S. Portfolio Ambassador Rocky Yeh. Stiggins’s Fancy in background. Near the end of the presentation, we finally got to the Stiggins’s Fancy rum. It’s a pineapple-infused rum that came about from a collaboration between Alexandre and David Wondrich, a true cocktail-world treasure and my favorite spirits writer. Only a relatively few bottles of Stiggins’s Fancy were produced, as it’s very expensive (tiny, very expensive Queen Victoria pineapples are used) and time consuming to make. 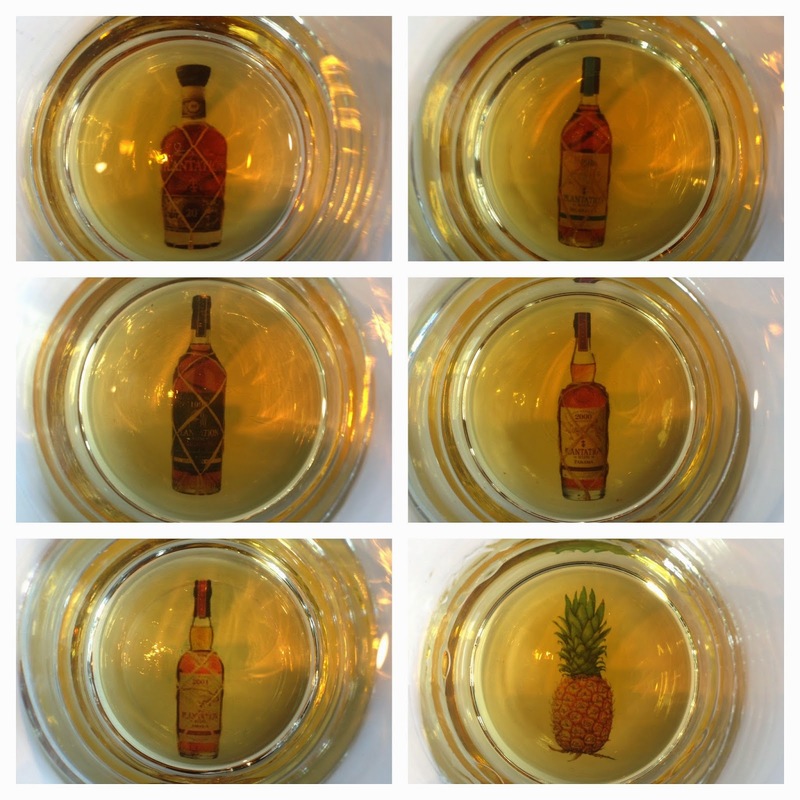 The Stiggins’s was first seen at a Plantation-hosted event at Tales of the Cocktail this year, and the few bottles out in the wild now are highly treasured. So far, I’ve not been able to lay my hands on one. Thus, I was elated that Rocky Yeh was able to supply a bottle, which we all got to sample. Simply stated: It’s out-of-control amazing. Many folks are pushing Alexandre to formally release the Stiggins’s, but at the time of the Rumba event, Alexandre still hadn’t decided if it was economically viable to produce on a larger scale. Rumba Bar Manager Jim Romdall introducing the rum map. As part of the tasting, Rumba launched their rum map, wherein once you try a certain number of rums from various regions (sixty rums in total), you receive a DTO or “Daiquiri Time Out” coin, which entitles you to a daiquiri upon future visits. For this event, attendees were able to use the rums we tasted to fill slots in our newly started rum maps. Very nice! Cocktail Wonk and Alexandre Gabriel. Photo credit: Nicholas Ferris. After the formal event wound down, I was able to speak with Alexandre individually for about twenty minutes, during which I peppered him with questions and clarifications. He seemed genuinely happy to answer and even told me a few things followed up by, “But don’t blog that,” a request I’ve tried hard to honor here. I left the event with my head spinning from all the things I learned, and even more excited than before to see what Plantation Rums does next. Alexandre Gabriel, Jim Romdall and Kate Perry at Rumba. Photo credit: Rumba. Matt, this a very interesting post! Personally i agree with Gabriel on his terroir opinions. Also a high ester rum from elsewhere with a different flavor profile, can`t wait to try it ether! Now…i really do love me some Jamaican rum but it´s interesting to see what´s up…btw that Pineapple rum…the Stiggin´s Fancy..i loved it! it´s the deepest and least "overflavored" pineapple rum i ever had. I soooo wish it to be sold!